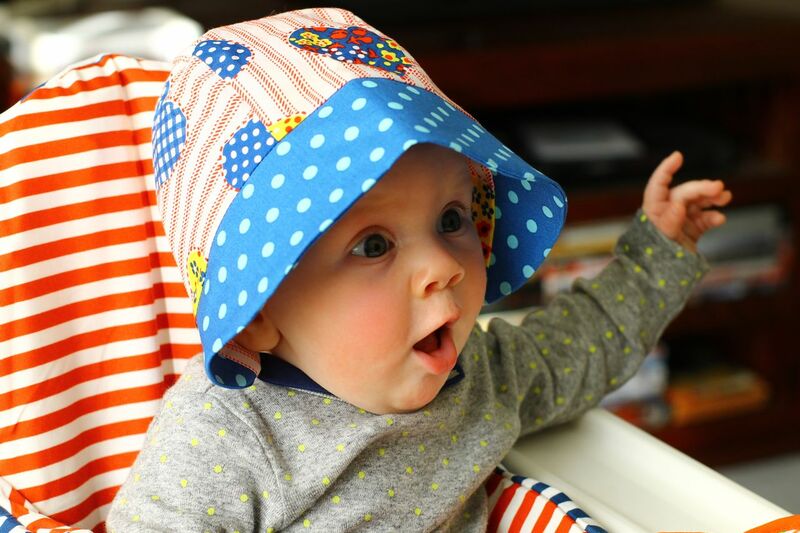 Kids’ clothes are so small and quick, I don’t realise I’ve made so many until it’s time for a round-up post like this. This isn’t a post about awesome patterns or sewing skills, because most of these patterns are repeats on a theme, and the garments themselves are a serious case of done being better than perfect. But it IS a post about how great life is when you’re a kid! These two. They’re the best. Where do I start? 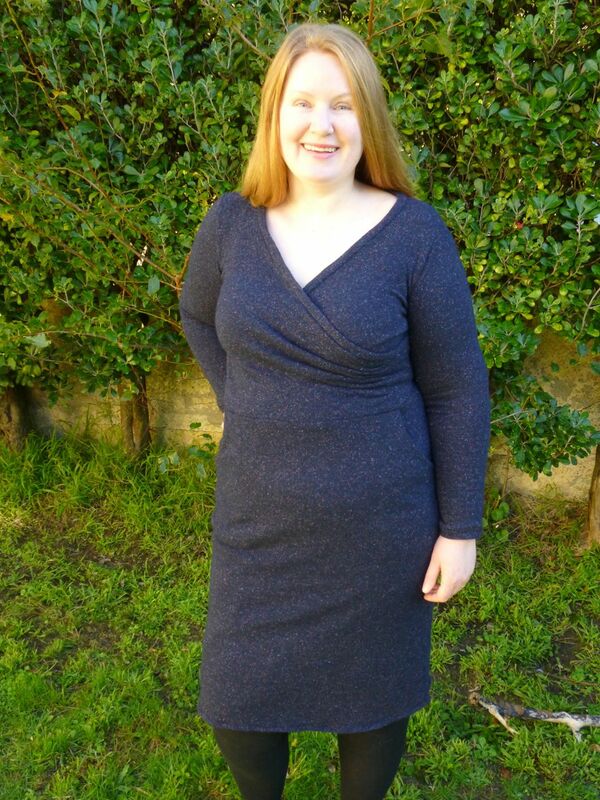 I’m going to start with (a rather blurry) Butterick 6678, because I’ve made this dress seven times over the last 18 months. 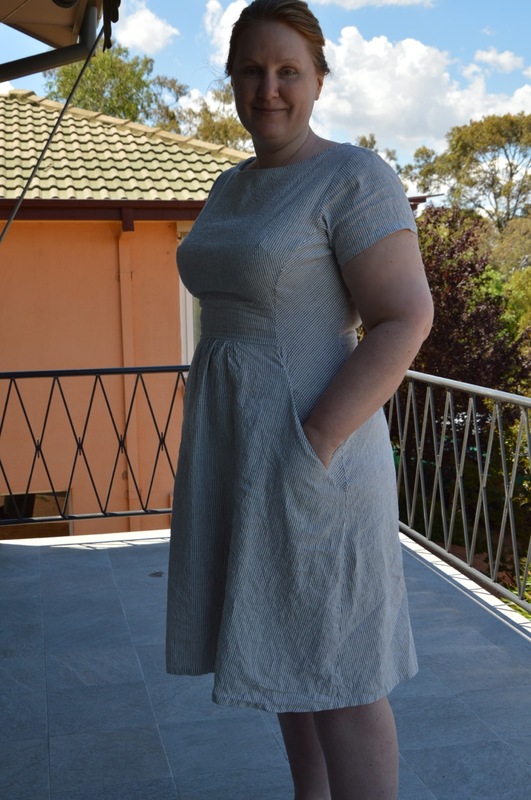 It’s a lovely simple dress to show off a nice fabric – this one’s part of my loot from Japan. 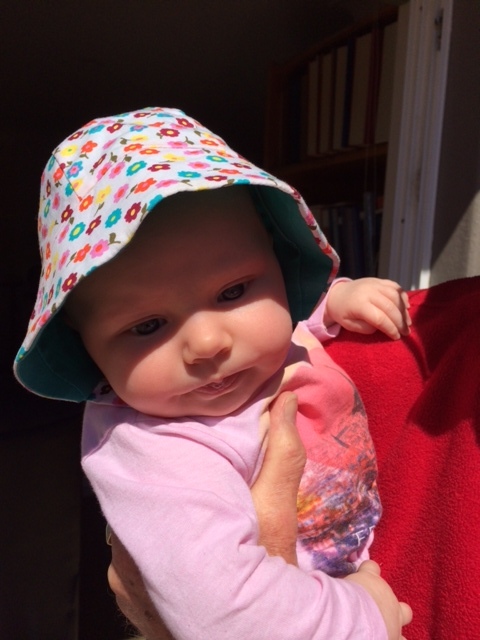 Note the fearless pattern matching and backwards gumboots. Look out, world. This next one was a third birthday present, made out of an old silk skirt and a bit of trim from the deep stash. Next, swimwear. My work colleague asked me to make a leotard for her little boy, and said I could keep the leftover fabric (and the pattern, Jalie 2912). Best. Fabric. Ever. I made the girls some swimmers. It was my first try making swimmers, and I made the arms too loose and the legs a bit tight. I think the take-home message is to just sew the unstretched elastic to the unstretched fabric, rather than cutting the elastic to size and then trying to fit it to the openings. While we’re doing bright, I’ll show you some rainbow leggings, which may well have been the clothing hit of 2017. Fabric from Spotlight. Pattern from Love Notions. I had to hold myself back from going back to buy more fabric, because seriously, if I had a pair of these I’d never take them off. Tell me you don’t want some too. Gosh this next photo makes me laugh. Not one, but two long-suffering dogs. I’m going to sneak in a sewing fail here. I used the rest of this green merino to make a matching t-shirt and skirt, but the skirt was way too big. 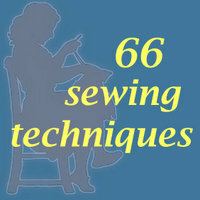 I’ve since found these handy reference charts for elastic waist measurements and skirt lengths. Both very useful for long-distance aunties. Similarly, these giraffe pants were too small in the waist, though they can easily be fixed. Isn’t this terrific fabric!? Thank you, Made Marion. The pattern is Oliver & S sunny day shorts, with in-seam pockets added and extended into trousers. Still good to ride a bike in. Or, y’know, for sitting in a bucket. And, an assortment of t-shirts. 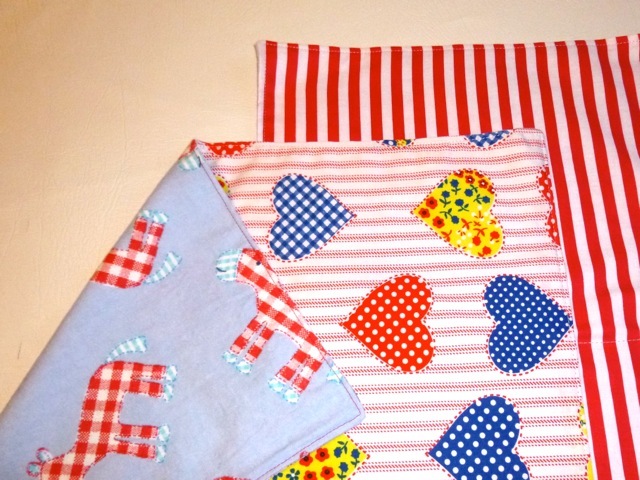 Fabric from Fabric-a-brac and pattern from Peek-a-boo patterns. (Modelled with backwards gumboots, once again). Now some winter wear. I saw a dinosaur hoodie somewhere, and had to copy it. These are adapted from this pattern. The spines are stuffed with a little bit of craft wadding. Last but not least, winter coats. During a Fabric Hoarders sewing retreat the lovely Margaret was giving away the makings for two lined wool coats, that she’d started. The intended recipients had grown too big before she could finish them. I swooped in and finished them off for these two ragamuffins, and they couldn’t be more perfect. They’re a Burda pattern. Sensibly they have a zip front (and wind guard) as well as the toggles. And that’s it! Well, nearly. 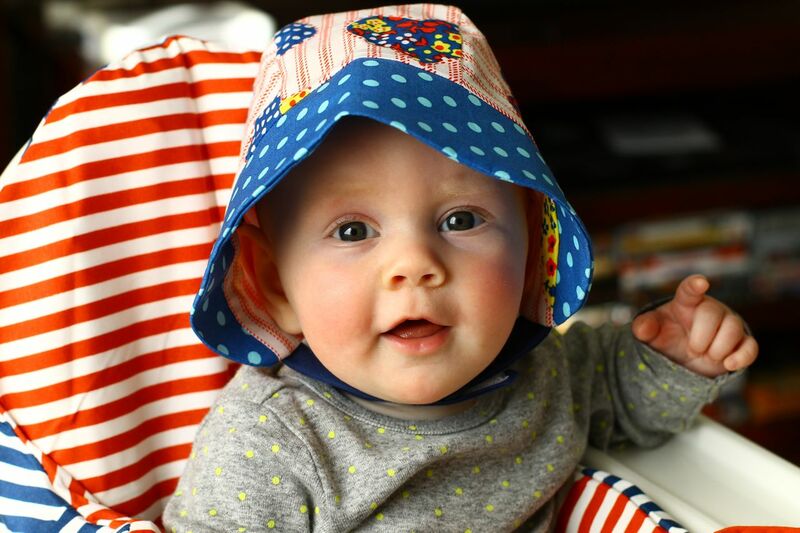 Two more cute photos. The girls have already started “sewing”, enabled encouraged by their doting auntie. Yep, it’s a classic early-January post, guess who made a new year’s resolution to do more blogging? I have several things to show you, but here’s the first (and the second to the twenty-fourth, if you want to be pedantic). If you’re not into cute, look away now. My two scallywag nieces have been the best scrap-busters ever. First there are these two little dresses, one from red wool and the other from green fleece. I think I found a free kids’ t-shirt pattern somewhere, and improvised the rest. Win! Next is a teddy bear onesie, which was a giveaway from Nordic Patterns via Sew Mama Sew… strangely I can’t find any trace of Nordic Patterns any more. The pattern’s still there for download, though. Lastly, for Christmas presents I whizzed up a few pairs each of the Oliver & S sunny day shorts. These were a hit, even the size 3 ones (which looked a bit hip-hop to me, but then the recipient is pretty cool herself). I didn’t realise I’d made so many things til I put them all together like this! Anyway, girls, if you’re reading this from the future, don’t forget, I have an ulterior motive. A confession. I am not afraid of flying. I am not afraid of spiders. But I’ve been suffering from a bad case of knits-o-phobia. However this month the Monthly Stitch ran a Sew Stretchy challenge, and I decided that it was high time for some exposure therapy. The first exposure was a disaster. I’ll EASE into this post by making it EASE-y for you to guess what the problem was. Oh, is that a br-EASE blowing through the tr-EASE? Pl-EASE shut the door or I’ll fr-EASE. I dutifully cut the pattern as directed for my measurements. Five inches of ease in the hips? Yeah, sounds about right. The pattern is New Look 6097. 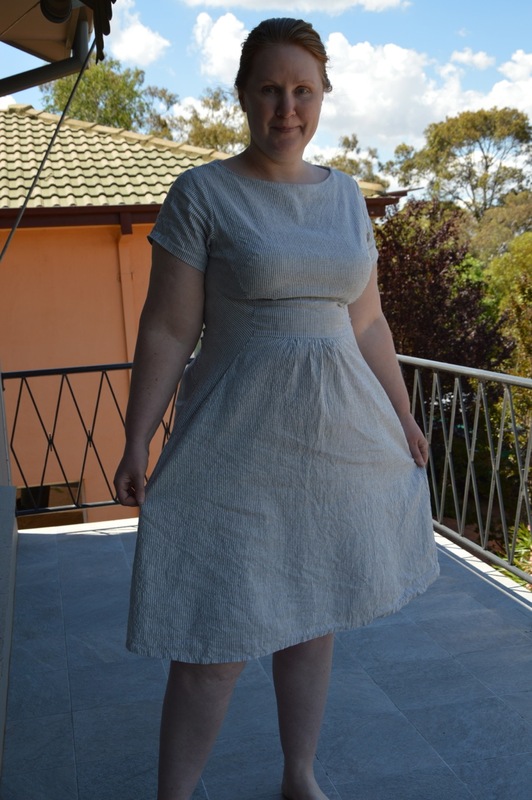 The fabric is a nylon/cotton blend from Levana (love that place). 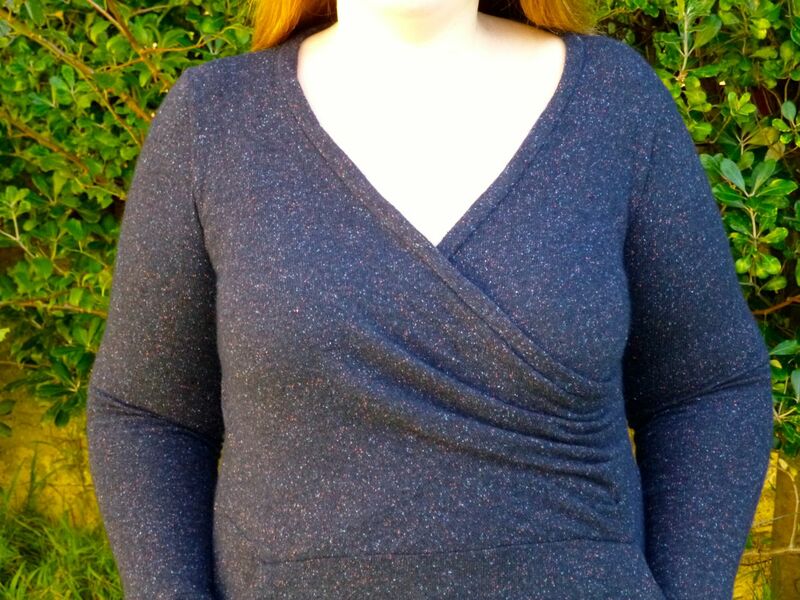 Now, there is nothing wrong with this pattern… IF you cut the size that has your bust measurement as the finished garment size (ie, zero ease). I ended up having to take it in twice at the side seams, and lift the shoulders by an inch, and narrow the shoulders by half an inch. 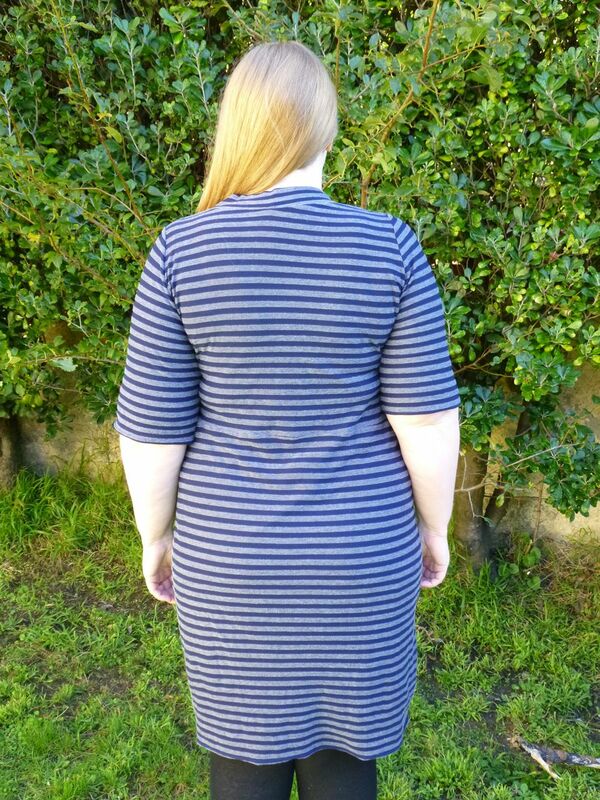 The first time I sewed the side seams I was careful to match all the stripes. By the third time… let’s just say they’re not perfect. Honestly, it was kind of a blitz and I’m lucky it turned out so well. 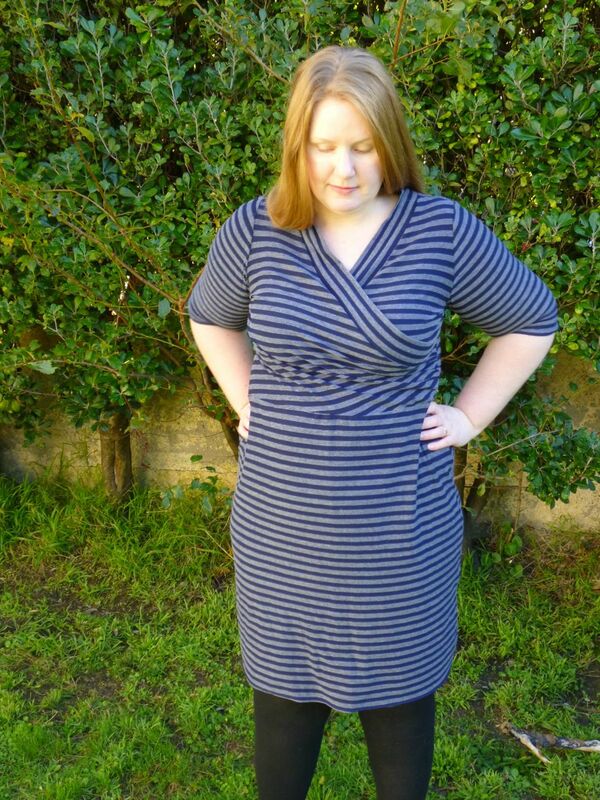 The other change I made (obviously) was to put a band around the neckline, and to cut elbow length sleeves. I also left the pockets off this version. Oh, and left the elastic out of the waist seam, and just fitted it a bit more snugly instead (it’s stretch fabric, after all). Final product: 9/10. The journey: 0/10. Version 2 was much simpler. 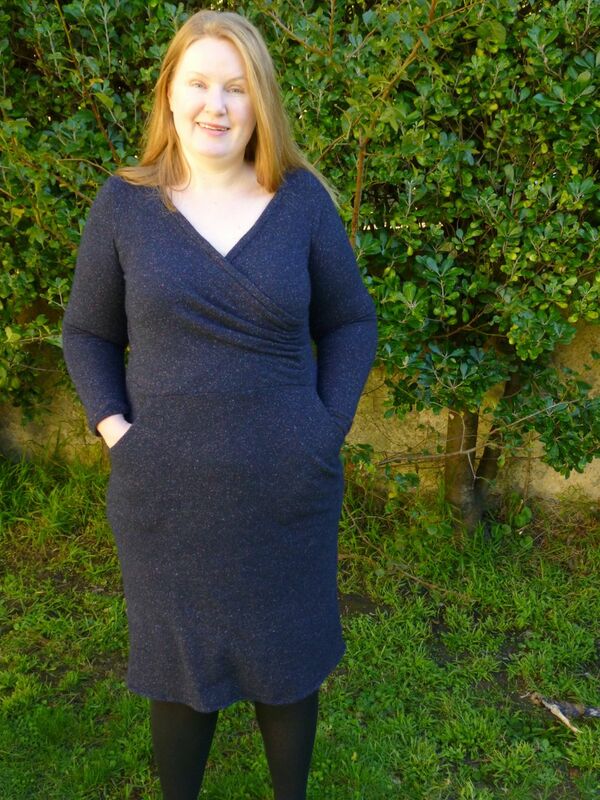 This one is in a divine wool/silk/nylon blend from The Fabric Warehouse (their 40% off sale made it about $17/m). I had an ‘oh no’ moment when I first tried it on, as it was a bit itchy, but I’ve washed it in conditioner and now it’s fine. 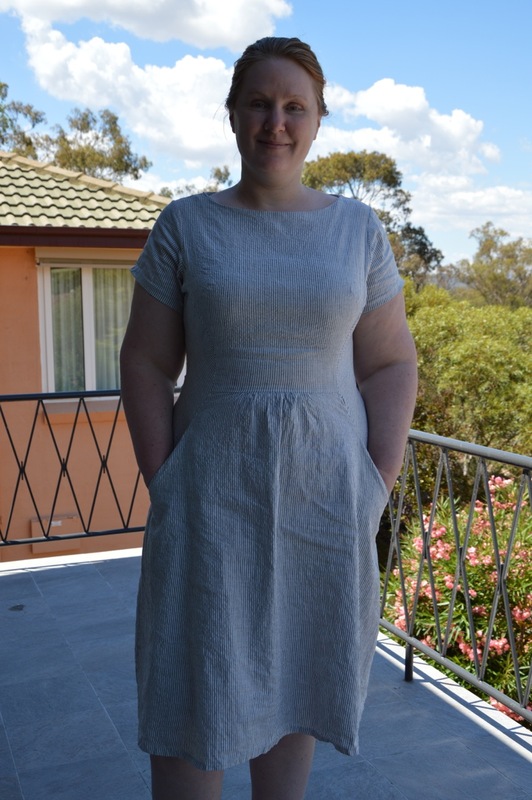 This one has long sleeves and pockets, and also has a band around the neckline. 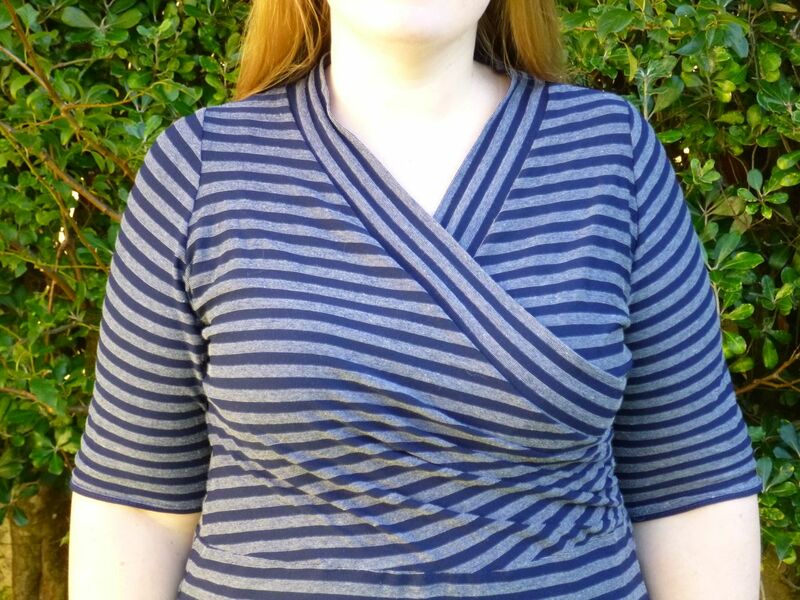 Next time I make this pattern (and I will make it again, we’re friends now) I’ll make the band shorter, so that it pulls the neckline in a bit more firmly. So, no more knits-o-phobia! And the rumours are true, sewing with knits is QUICK. 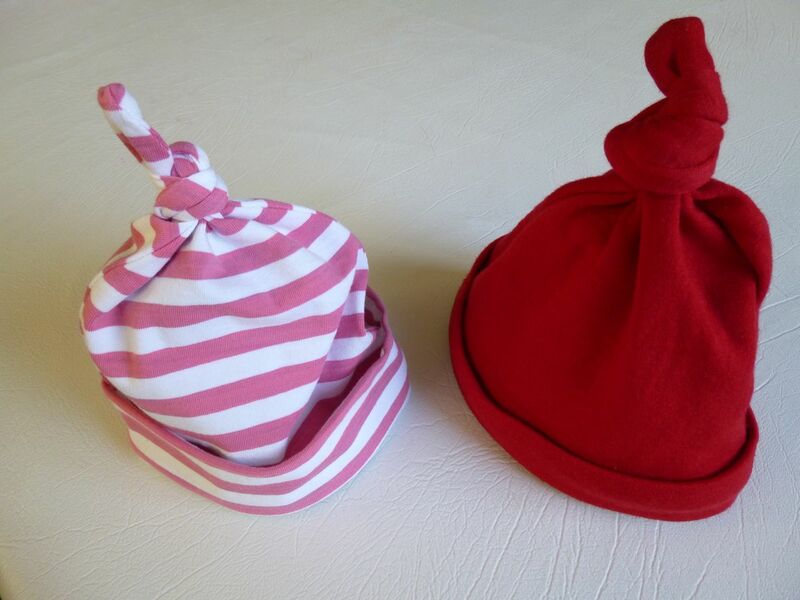 To prove it, here are two baby hats that took half an hour to make. Half an hour each? Nope, total! 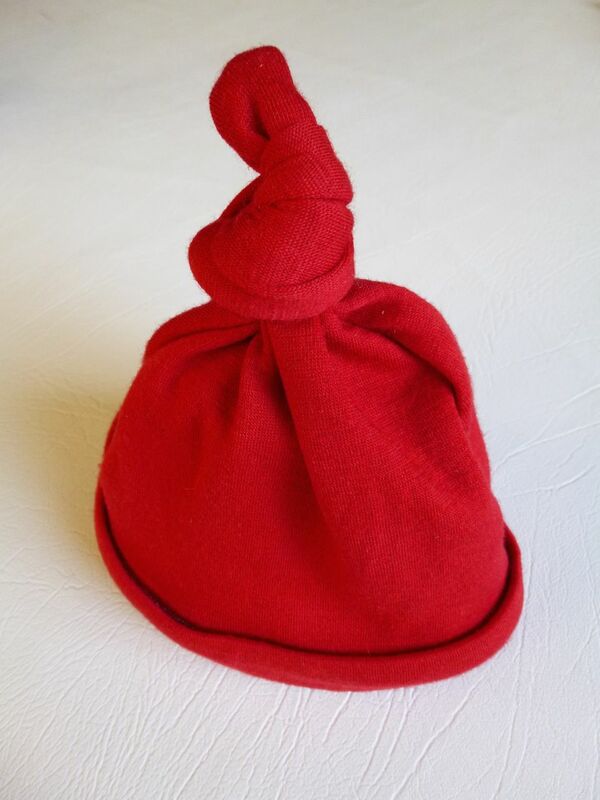 Made using the lovely top knot baby hat tutorial. 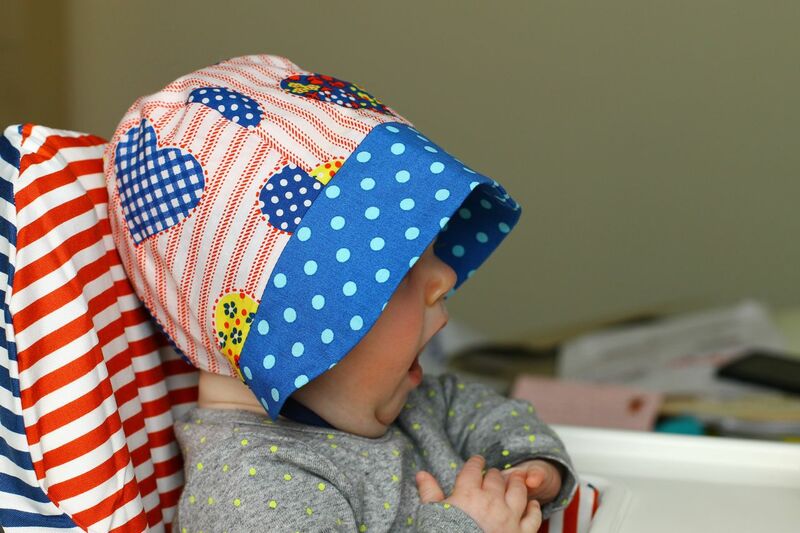 If you know a lot of new babies like I do, this is a great tutorial to add to your repertoire: you can make four hats from 40cm of 150cm-wide fabric. 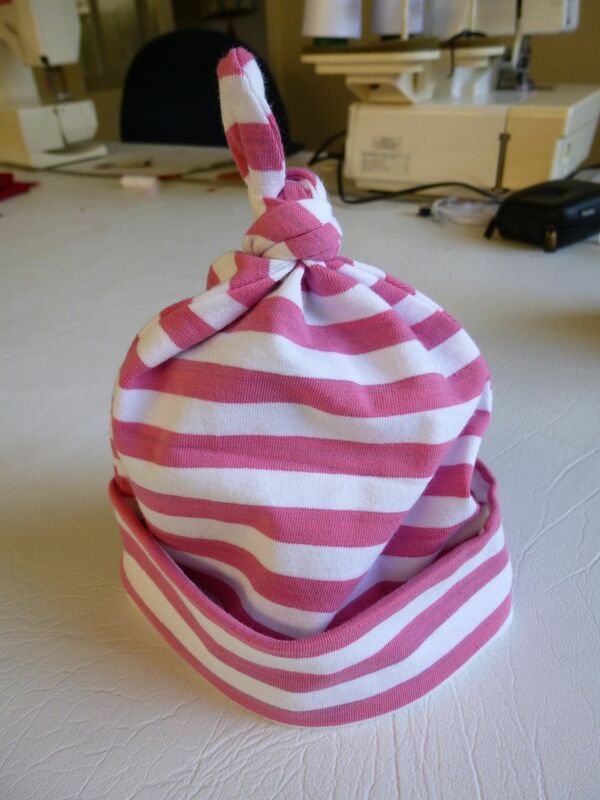 The pink-and-white stripe is courtesy of Fabric-a-brac, and the red is from Johanna (thanks Jo!). I kind of feel like I need another month of knits, to get them out of my system. 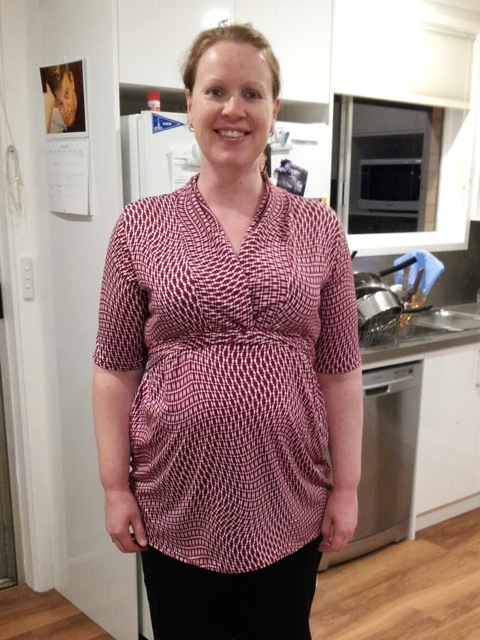 Here is my sister in another maternity top I made, once again using the (free! awesome!) Turn About The Room pattern. 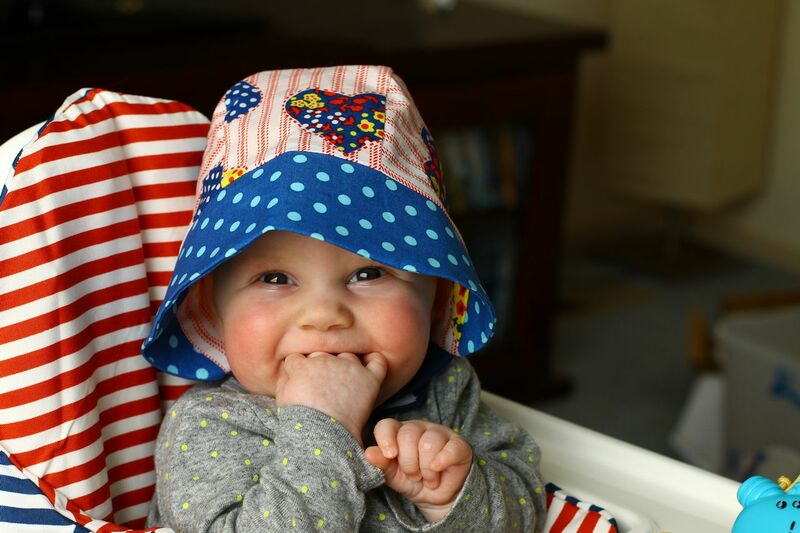 The fabric is from the Queen Victoria markets in Melbourne. I think I used this tutorial. One side is quilting cotton, the other side is flannelette. They’re about 47 x 32 cm (roughly 18 x 13″). 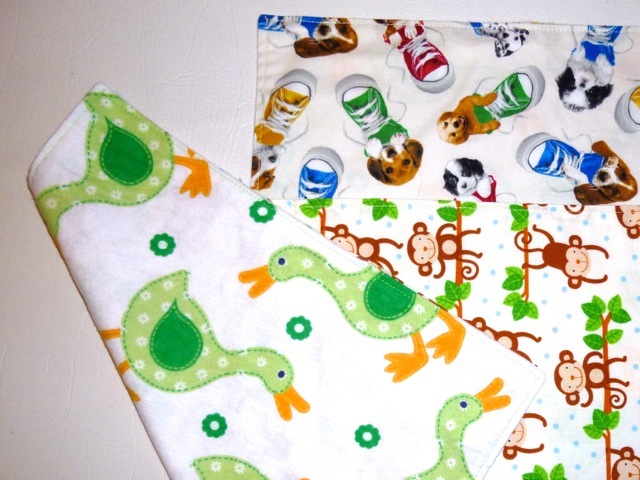 The horses and ducks are the flannelette, in case it’s not clear in the photos. Happy new year, all. I really hope 2014 is a good one and brings growth and happiness. On a personal level, 2013 has been quite an adventurous one for me, with an international move. But then, I am kind of a floozy with removal companies. I sleep around. This is the ninth city I’ve lived in, so far, and the third country. No wonder I don’t form a sentimental attachment to heavy items. But Wellington, you sure do make a good first impression. Maybe you’re the one. 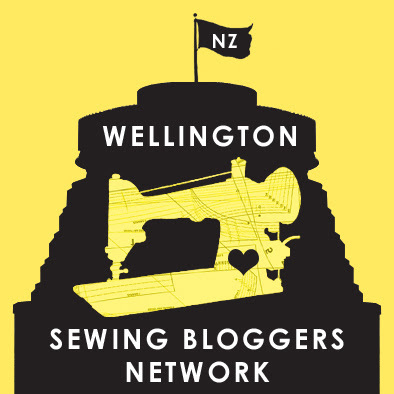 Thanks to those tireless WSBN ladies, I’ve been sewing my little fingers off, trying to keep up. The biggest project has been a mini maternity wardrobe for my sister, who’s expecting in early May. I made her three tops and the comfiest pair of lounge pants I have ever tried on and been tempted to keep for myself. Stretchy wide waistbands for all! 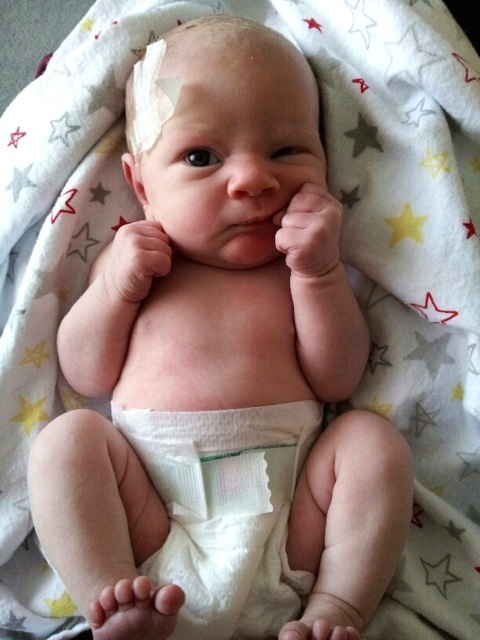 But photos will have to wait til she gets around to taking some. I also sewed a couple of things for a fundraiser day at the races in November. My horse is still running but it was an otherwise perfect day. They held a giant raffle and I donated a Christmas table runner and napkin set, and a baby quilt. The back of the quilt was a mixture of blue spots and hungry caterpillar. It kind of defeated the purpose of using up my scraps, as I had to buy a whole lot of extra linen and calico, but at least it’s for a good cause. And after eight napkins and two quilts, I’m ace at mitred corners. A work trip to Palmerston North meant a quick detour to the Arthur Toye closing down sale, and two lovely cotton sateens and a cotton/linen stripe. None made it into the stash! They are all summer dresses. 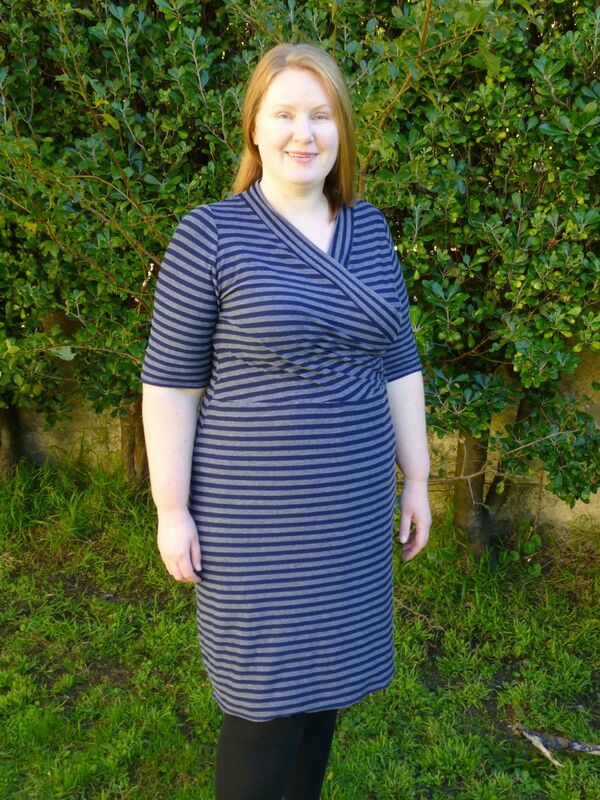 I only have photos of the striped dress so far, modelled on my Christmas break. It is great for lots of reasons. Three neckline variations, including raglan cap sleeves, which I love. Princess bodice = a good fit. Gathers in front and back, to make room for the Christmas pudding. POCKETS (great big ones). 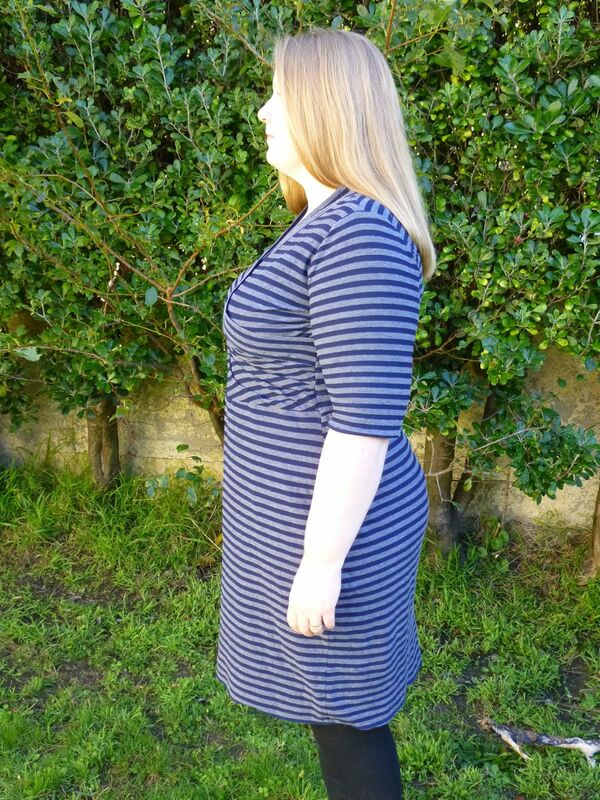 It’s a fantastic pattern for stripes, as the side panels are on the bias. A couple of years ago I made the sleeveless V-neck version. Totally different dress. I love that. Three hours of 2013 to go! Have fun, everyone!